Bridging the connection between marketing students, practitioners, and professors. The Marketing Bridge by Theresa Flaherty is no longer active. Please visit http://theresabclarke.com for blog posts by Dr. Theresa B. Clarke. Thanks. Select a business that is willing to let you install Google Analytics on their site. Once the business has agreed to participate in the Challenge, get Google Analytics up and running as soon as possible [http://www.google.com/analytics]. While Google Analytics is not required in the Challenge, many of my top performing teams from past Challenges found Google Analytics to be extremely helpful. Not only is linking the accounts a free service, but there are some distinct advantages associated with linking Analytics and AdWords. 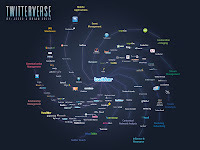 First, it helps to consolidate all marketing activities in one place. Second, it simplifies the ability to analyze online marketing activity. Finally, it provides some insight on the quality of AdWords site traffic, not just the quantity of traffic. If the above assumptions are true, there will be a pull down for “Existing Google Analytics Account” and the account should be selected in that field. Make sure the “Destination URL Auto-tagging” box is checked (this will allow for some deeper Analytics data). The Google Analytics interface should now be available directly in Google AdWords and linked to the profiles selected. Proceed with caution once the accounts are linked. As Avelyn Austin from Search Mojo explains, one mouse click can cause you to lose all of the data located in a Google Analytics account. In her blog post, she provides five useful tips to help avoid losing Google Analytics data. I welcome additional tips, suggestions, and resources associated with linking Google Analytics to Google AdWords. As an active professor involved in the Google Online Marketing Challenge, I wanted to write about how to select a business for the competition. The 2010 Google Student Guide (page 8 specifically) provides general guidance for selecting and working with a business or organization. For the Challenge experience to be most rewarding, selecting the right business is critical. In sum, Google advises students to select a small-to-medium enterprises (SME), business or non-profit, under 100 employees, that has a website but does not currently use Google AdWords (and has not used AdWords in the past 6 months). Google has content guidelines and will not run AdWords on sites that promote inappropriate items such as academic aids, bulk marketing, counterfeit designer goods or cigarettes. Prospective clients should not have participated in the 2009 Challenge. Below is additional guidance to help in selecting a suitable client. These tips reflect my personal views and past experience working with students on the Challenge. They do not represent official views of Google, the Google Online Marketing Challenge, or the 2010 Google Student Guide. Utilize your network of friends, family, co-workers, professors, and acquaintances to assist with initial brainstorming. Come up with at least ten different businesses that would be good candidates for the Challenge. Seek businesses that are open to making some minor changes on their website. Either they can make the changes on their end, or your team can make the changes (if they are willing to provide you the necessary security credentials to modify their site). This is not a requirement of the Challenge, but something that is quite helpful. Typically I advise students to select businesses where the point of contact is willing and able to make minor modifications to the website on short notice if needed. If major modifications are needed to the site, it provides a great learning experience but creates an added layer of complexity to the project. Meet with the prospective clients personally to get a feel for what it might be like to work with them. Are they hard or easy to reach by phone, e-mail, social media, etc.? Are they responsive to your questions? Do they seem genuinely interested in working with you? The more the client collaborates with you, the better the experience for everyone involved. This is definitely not a requirement of the Challenge, but I believe a local business is preferable over a non-local business. One reason is that it is easier to meet the client in person when they are in close proximity. Another reason is that it assists in local/regional PR efforts and community outreach associated with your institution. Coming from a public, state institution of higher education, I believe it is important to support the local businesses in our area. Of course, a non-local based business is acceptable for the competition if the team has a great connection elsewhere. Carefully evaluate the website of the prospective clients to determine if a basic structure is set in place to develop highly focused campaigns. Think about the different kinds of campaigns and Ad Groups you might run in AdWords and then examine the "landing pages" of the client to assess the overall relevancy. Here, you are seeking a strong fit between your online marketing ideas and the existing landing pages of the prospective client. Select a business that has a lot of content on their website and does not use FLASH or other non-HTML technology. Double-check that the business was not used as a client for the 2009 Challenge. Double-check (and triple-check) to ensure that the client does not use AdWords and has not used AdWords in the past 6 months. I had two occasions where teams were told by the client that their business does not use AdWords, but upon further exploration the teams learned that the business did indeed use AdWords. Why does this happen? Sometimes the point of contact at the business does not understand AdWords. Sometimes the point of contact does not realize that another member of the business, often in a different department, is running an AdWords account. Sometimes the point of contact forgot that he/she tried AdWords a long time ago, and the account is still running. Select a business that is willing to let you install Google Analytics on their site. Once the business has agreed to participate in the Challenge, get Google Analytics up and running as soon as possible. http://www.google.com/analytics/. While Google Analytics is not required in the Challenge, many of my top performing teams from past Challenges found Google Analytics to be extremely helpful. Finally, select a business that you like and understand. If you are not excited about the business and their products/services, it won't be a fun experience. I have shared these same tips with my 2008, 2009, and 2010 Challenge participants from the Department of Marketing at James Madison University. If there are additional tips to share, I welcome your comments on The Marketing Bridge blog. Finally, a special thanks is extended to Dr. Jamie Murphy for his feedback on this blog post. I am more than happy to help my students with their job search. But I am often surprised by a few common mistakes I see with regard to references. a) Ask your references to actually serve as a reference. Don't make the assumption that someone wants to, or will be, a reference just because you had interactions with them. I just received a phone call from a prospective employer who indicated that one of my former students listed me as her reference. This student never asked me to serve as her reference but made an assumption that I would be a reference. (Recall the famous saying about what happens when you "assume"? I won't repeat it here.) The bottom line is that you should simply ask people to serve in this capacity. b) For the people who have agreed to serve as a reference, inform them about your situation so they are prepared to talk about you. Personally, I like to have a copy of someone's resume or access to a LinkedIn profile. I also like to know career plans, the types of organizations that may be contacting me, and where someone is in a particular job search process (e.g., initial applicant, just had a second interview, etc.). Do these two simple things and you increase the chances of references making a positive impact. You also create fewer surprises. I am seeking ambitious, self-directed, entrepreneurial, highly motivated, responsible, and talented JMU students who are interested in participating in The 2010 Google Online Marketing Challenge. Contact me at flahertb@jmu.edu for details. One of my 2009 JMU Marketing teams was ranked in the top four in the world out of 2,187 teams; two other JMU Marketing teams were in the top 150 in the world. As part of winning the America's region, me and my 2009 JMU Marketing team will be traveling to the Googleplex in November of 2009. One of my 2008 JMU Marketing teams was ranked in the top ten in the world out of 1,670 teams; four other JMU Marketing teams were in the top 10% in the world. As part of the finalist award package, me and my 2008 JMU Marketing team visited the Googleplex in the fall of 2008. Participating in the Google Online Challenge added a valuable marketing tool to my skill-set that separated me from other candidates when applying for jobs after graduation. There are a number of incredible opportunities in both small and large companies that value a marketer's understanding of Search Engine Marketing. The hands on experience is far more beneficial than simply learning in a class. Multiple times throughout interviewing and my job search I was able to draw from what I had learned while participating and use as talking points to employers. In addition to helping you get a job, it is something that you use everyday and is so much more interesting when you know how it works. Read the Google Online Marketing Challenge website very carefully and contact me at flahertb@jmu.edu if you have further questions. One of my former JMU marketing students, W. Jesse Wright, recently completed an intern program at Crispin Porter + Bogusky (CP+B), a top awarded advertising agency in the US. I was excited for Jesse and wanted to hear more about how he landed the internship. Jesse contributed to this blog post by sharing his story and providing some advice for current students. Jesse graduated from James Madison University in December ‘08 and applied for a CP+B spring internship through the traditional channel, sending his resume and cover letter to Human Resources. This landed no tangible results and he soon found himself in the worst job market in 30 years. He continued to shoot resumes and cover letters to local firms and companies all over the US. Realizing the walls he was running into and fed up with presenting himself via 8.5 x 11” PDF files, Jesse decided to take a chance. He sent his application to a local firm with his resume taped to the back of a champagne bottle suggesting the reader “enjoy some bubbly while looking over [Jesse’s] qualifications.” It worked! He got an interview! No job, but an interview! The free booze was a nice touch but Jesse knew the tactic was not the ultimate solution. “I knew that a gimmick would get me noticed but I really needed to connect with the decision maker and present quality content in an original, attention-grabbing way,” Jesse said. Jesse wanted to take another stab at CP+B. He researched the top decision makers and found out that one executive played guitar and the agency had donated hundreds of guitars to local youth. Jesse utilized social media to reach out to him, hoping to gain some wisdom and perspective from the industry veteran. Jesse communicated an ultra-abbreviated resume and asked his advice. Jesse also threw in a guitar joke he had heard two guitar-playing buddies say a few months before. Keep in mind that advertising agencies are most likely to fill full-time positions when: 1) the applicant is an advertising genius and gets the agency's attention, 2) the agency is diversifying services and the applicant is a specialist in the field and gets the agency's attention, and/or 3) the agency landed a new client, the applicant is both an expert in the new client’s industry and gets the attention of the agency. If you do not fall into one of the above three categories, another strategy may be in order. 1. Before communicating with CP+B, Jesse did his homework by reading industry news such as Career Advice from CP+B, B-NET, Creativity, etc. As an additional suggestion, check out what is available in Twitter such as @CPBInterns. 3. While Jesse's communications with CP+B were pro-active, they were not aggressive. The conversations started with obtaining advice and guidance. They moved on to expressing Jesse’s passion and connecting his skills with CP+B’s goals. 4. Jesse paid attention to the details and showed CP+B that he was listening to them. 5. Jesse showed appreciation for the time given to him with personal notes and respect. If you have suggestions on how to get an internship in advertising, feel free to comment on this post. The number of marketing professionals in the Washington , DC area is on the rise every year. To address this increasing interest in the advertising industry, the DC Ad Club, a not-for-profit organization for area communications professionals, is again hosting their fall event. Advertising Week DC 2009 will bring together advertising industry leaders, professionals and university students on September 14-18 for presentations and speeches by some of the most successful and inspirational individuals in the field. This year’s event will include keynote speakers: Shelly Lazarus, Chairman, Ogilvy & Mather Worldwide; Liz Dolan, Chief Marketing Officer, The Oprah Winfrey Network; Stuart Elliott, Advertising Columnist, The New York Times; Mark Whitaker, Washington DC Bureau Chief, Senior Vice President, NBC News; Chuck Todd, NBC News Chief White House Correspondent, NBC News Political Director, Contributing Editor, ‘Meet the Press,’ along with other great names. This week of seminars and networking will provide a wealth of information to anyone in the communications field from interested up-and-coming university graduates to industry veterans. Additionally, ticket prices are significantly discounted for students. For more information, and to register please go to http://www.adwkdc.com/. Reprinted with permission from Melissa Madaio [MelissaMadaio@lmo.com]. Boston University College of Communication - Extensive masters degrees offered in marketing communications, advertising, and public relations. Creative Circus - Don't let the name fool you. This is a top portfolio-building school specializing in advertising art direction, advertising copy writing, commercial photography and design. Interactive, digital and traditional disciplines are all taught, producing grads who are ready for the best jobs in their chosen fields. The Miami Ad School - The most awarded ad school in the world, based on the quality of awards received by their students (Source: Gunn Report). Northwestern University - Known for producing some of the best communicators in the world. When I think of pioneering IMC, I think of Northwestern. Texas Advertising and Public Relations - Their mission is to create exceptional communication specialists who are eager to enter either a business world or academic community. The VCU Brand Center - The leading advertising graduate program in Virginia. For my James Madison University students who don't want to go far from home, this is your place! As always I welcome comments, particularly if you have first-hand experience at the above named schools. I just read a fascinating article written by Raquel Laneri from Forbes.com. Raquel provides excellent insight and advice about common body language mistakes in classroom, social, and business settings. While her article is aimed at professional businesswomen, there are some great tidbits in there for men as well. -- Be careful about how and when you tilt your head. --Avoid excessive smiling; instead make your facial expressions congruent with what you are saying. --Don't fold your arms in front of you. --Never play with or tug at your hair, jewelry, or clothes. How can you become aware of some of these habits and learn to suppress them? First, ask a trusted friend, colleague, mentor, or business partner to provide some honest feedback about your non-verbal body language. Once they help you to identify the undesirable gestures, try to replace a bad habit (e.g., tugging at jewelry) with something that might not be so noticeable (e.g., wiggling your toes). Another idea is to give a speech in front of a videocamera. Watch the video without the sound on in order to focus on your non-verbal gestures. Finally, watch yourself in a mirror while you speak to someone on the telephone. This allows you the opportunity to become self-aware of body language in a more private setting. According to a Jump Start Media poll of hiring managers, 75% use LinkedIn, 48% use Facebook, and 26% use Twitter to research candidates before making job offers. Chris Russell, from Secrets of the Job Hunt, advises job hunters to "Start with one service, get comfortable with it, and branch out from there. The easiest, safest choice is LinkedIn because it has always been 100% business focused." I concur with Chris' advice because LinkedIn is well known for helping people to find jobs, identify business partners, keep in touch with professional colleagues, and so much more. There are many excellent resources about how to use LinkedIn. One of my favorites is How to be a LinkedIn Superstar by Larry Weintraub (CEO of Fanscape, a leading Digital Engagement Marketing Agency). • LinkedIn '09 Grad Guide - a how to guide for establishing a network on LinkedIn. • '09 Grads Group in LinkedIn - a LinkedIn group for learning from peers, educators, professionals, and the LinkedIn staff. I suspect that LinkedIn will offer a similar guide and group for 2010+ grads as well. Good luck with your professional networking! Theresa B. Flaherty can be reached on LinkedIn at http://www.linkedin.com/in/flahertb. 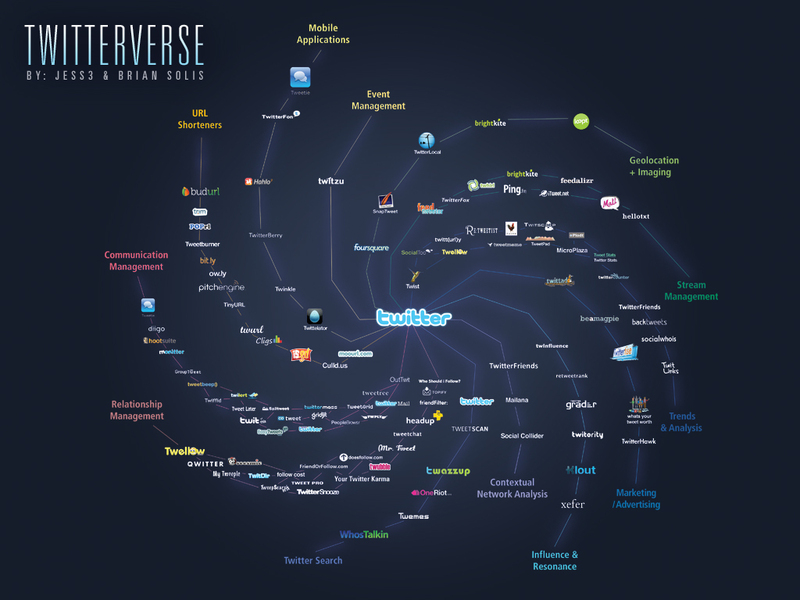 The Twitterverse v0.9 by @BrianSolis & @Jess3 (cc) is a detailed and succinct data visualization that summarizes the current ecosystem in the Twitterverse. Each strand represents a different tool and opportunity including mobile applications, event management, geolocation + imaging, stream management, trends & analysis, marketing/advertising, influence & resonance, contextual network analysis, twitter search, relationship management, communication management, and URL shorteners. Contact www.briansolis.com + www.jess3.com if you have feedback or ideas on how to reorganize the placement of Twitter apps. Download the Original size - All sizes of this photo are available for download under a Creative Commons license. so pissed off ....and it's only 8:30am. is so bored at work. just got out of the most dull meeting in the world. finished my lunch, back to work. checking out what's up in facebook. get me out of here, 30 minutes until work is over. My first reaction to this series of tweets was "WOW --- what a downer!" I know we all have our days when we wake up on the wrong side of the bed, but Twitter is not the venue to vent about every frustrating experience, especially if you are a potential job candidate. Do I want my employer, or a potential employer, to read my tweet? Is my tweet a result of a highly negative emotion (you might regret it)? Twitter asks "What are you doing?" in the dialog box, but avoid using that opportunity to complain. Instead of a constant stream of negativity, aim for tweets that are relevant, engaging, original, and uplifting. You are more likely to gain a stream of like-minded followers and you are more likely to land a job when you think before you tweet.